The View from the Bottom is Mike Millisor and Mike Dudick’s monthly letter to all of the stakeholders of the Breckenridge Grand Vacations family of resorts. You’ve heard the expression, “Every picture tells a story.” Well, the owners of the new restaurant at Grand Timber Lodge believe every boot has a story—one of adventure, challenge or even championship. Such endeavors require hours and hours of perseverance—hence, the name The Stinky Boot. Located in the space once occupied by the Lodgepole Bar and Grill, “the Boot” channels the laid-back ski lodge vibe of Colorado in days past. Part of this ambiance is created by the growing collection of mountain-related memorabilia on the walls and shelves that evokes the spirit of the 1970s, 1980s and 1990s. For example, there’s a pair of ski boots worn by Breckenridge legend CJ Mueller in one of the three instances in which he broke the downhill speed skiing record, this one at 131 mph!!! There’s an autographed ski from three-time Olympic alpine champion Jean-Claude Killy. Of course, what more of a Breckenridge way to celebrate Killy’s achievements than to turn it into a shot ski (be sure to ask for it when you’re there). There’s also an autographed poster and snowboard boots from Steve Fischer, noted Olympian and X-Games champion. They even have a roller-skating boot worn by our very own Dawn Vranas (HR department) when she skated in the US National Championships in the 1990s. This hidden gem is a place where owners, friends and locals alike can kick back, mingle and enjoy drinks and appetizers (Happy Hour is 2:30 to 5:30 p.m. daily) or have a delicious lunch or dinner. You can watch old ski films inside or hang outside by the firepits. The American pub food is a creative step up, serving something for everyone. The fare includes sandwiches, salads, chili, pizza and appetizers. Some of these offerings redefine the phrase “comfort food”: think Tater Tots with bacon, queso, sour cream and scallions. Yum! “The Boot” also has an event space that can accommodate reunions, rehearsal dinners or any kind of group dinner. With a capacity of 25 to 65 people, it’s the perfect spot to gather for a special occasion with family and friends. The Stinky Boot is open every day from 11 a.m. to 9 p.m. We hope to bump into you there sometime soon. 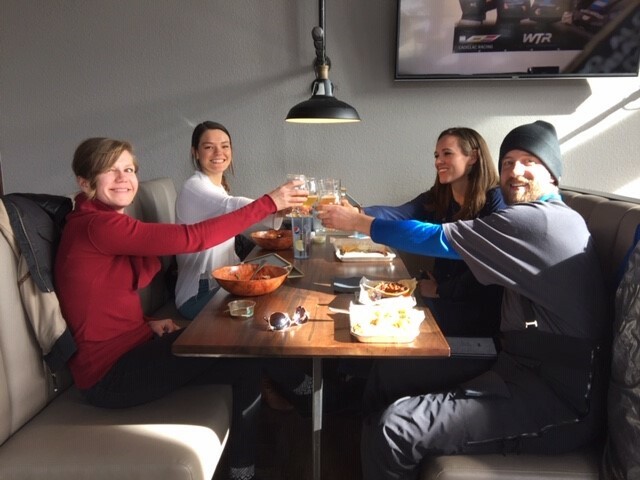 Until then, from our table to yours, we thank you again for being a part of the Breckenridge Grand Vacations family. Volcanoes, palm trees, wonderful beaches, scuba diving and exquisite scenery – yes, Hawaii has it all, and so it’s no wonder the area has the highest demand within Intervals Network. We certainly want to get you to the Aloha State!